The Molok Deep Collection container is emptied by a driver operated crane using a remote control. This eliminates the heavy manual handling of surface containers. As a result, the physical strain for the driver is clearly less than when surface containers are emptied. Watching the emptying, the truck's crane moves easily with the remote control and the trash drops from the hoist into the truck. The driver uses the remote control precisely with no visible sense of hurriedness. Yet, the emptying time of the five cubic meter Molok tank is well below two minutes from the time the crane hook is attached to the lifting lug on the waste tank lid until the waste is emptied, the tank returned and the crane hook removed. 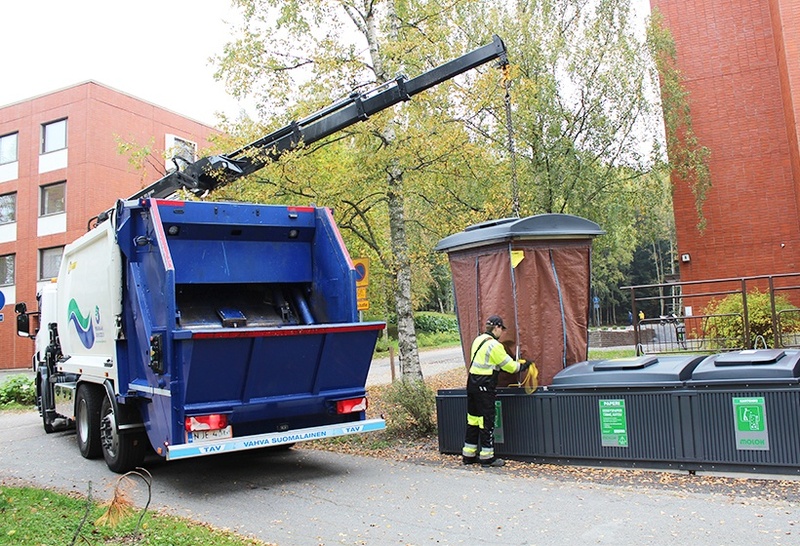 Large amounts of waste are emptied by the crane at an astonishing speed and the driver does not have to haul traditional waste bins. The coolness of the ground discourages microbial activity and, with the assistance of gravity, the waste packs tightly with the oldest foul-smelling waste at the bottom. For that reason emptying Molok containers is a more odor free and much more agreeable task. Compared to emptying conventional surface containers, emptying by crane is much quieter. This also contributes to increased work well-being.